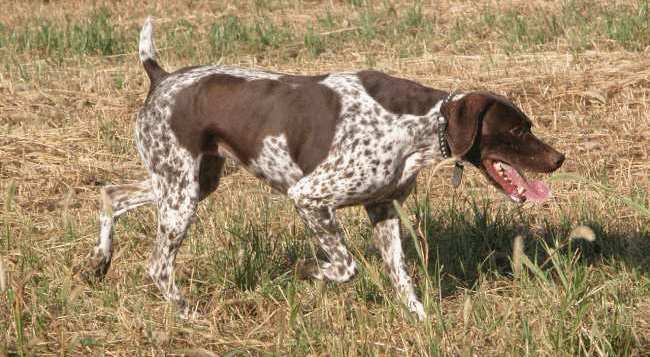 The Braque Français (French Pointer) is believed to have derived from dogs used to point game in the Mediterranean region as early as the 1300s. 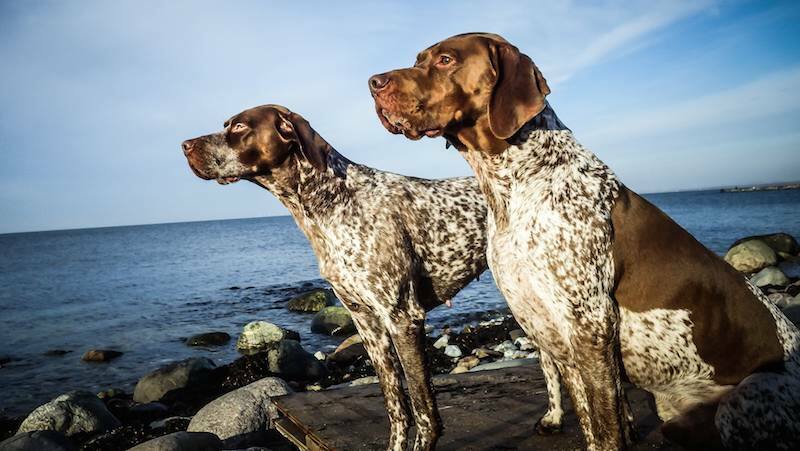 When these brown-and-white pointers spread throughout Europe, they evolved into regional types. In France, each type took on the name of its province. The Braque Francais dog breed is docile, sociable, gentle and submissive. General Appearance: A dog of noble appearance, powerful but not heavy, robust and strong limbed. Head & Skull: Not too heavy although weighty enough. The skull, almost flat or very slightly arched, gives a lightly marked central ridge: the occipital projective little pronounced. Stop is neither let in nor accentuated. Muzzle: Straight, big, rectangular with lips well dropped and junction of lips wrinkled. Nose is broad and chestnut in colour. Nostrils well open. Eyes: Well open and well set in the orbits; maroon in colour or deep yellow. The look is confident, thoughtful and affectionate. Ears: Of average length, set level with the eyes, not too big at the attaching point, well framing the head, slightly folded and rounding at the tip. One or two vertical wrinkles must show on the cheek flanges, on a level or a little below the ear attachment. Neck: Of good length, slightly arched on the upper part, appears a little thick on account of the dewlap which must always exist. Shoulders: Very muscular and moderately sloping. Chest: Big in front, deep seen in profile, reaching the level of the elbows, ribs are rounded but not excessively so. Back: Big, straight, sometimes a trifle long but always strong and firm. Loins: Short, muscular, slightly arched. Buttocks: Slightly slanting in relation to the line of the back. Haunches well out. Flanks: Flat and slightly raised. Tail: Usually docked and continuing the convexity of the line of the buttocks, however long the tail, if it is well carried, must not count as a fault more than a short tail. Thighs: Strong-limbed, but not always very sloping. Forelegs: Straight, large and muscular. Elbow well placed. Strong pasterns. Hindlegs: Hocks large, moderately bent, set low on short bones. Feet: Compact, nearly round or slightly oval. Pads thick. Strong nails. Hair: Rather thick and smooth, finer on the head and ears. Skin: Supple and fairly slack. Coat: White with more or less deep chestnut specks with or without the trout colour or entirely speckled, and chestnut speckled and sometimes liver speckled without patches. Some traces of a fiery pale shade will be above the eyes, on the lips and legs. Height: From 22-3/4 to 26 inches (58 cm to 66 cm). Faults: Head too short, cheek flanges too heavy, face too wrinkled, mealy spots on nose and eyelids, pointed muzzle, skull too narrow or too wide, light eyes, unkind or cross look, ears set too high or badly carried or too long, too curly, shoulders and ribs fine feet with insufficient spread. Disqualifications: Black nose, split nose, black specks or black hairs scattered over the coat. Link: Braque Francais club France.